For a healthier relationship with your smartphone, put it down—and out of sight. Last July the market-research firm Nielsen released a new study saying American adults are spending over 11 hours a day interacting with media. Another study by eMarketer says we’re spending 3 hours and 35 minutes looking at our devices. That’s a lot of screen time. Type the words “negative effects of smartphone use” into your Internet browser and behold the seemingly endless list of dangers, everything from neck strain to interrupted sleep to road accidents. The emotional consequences aren’t great either. Device use has been linked to decreases in closeness, trust and feelings of empathy between individuals. No wonder people are looking for ways to break the cycle. Apps like Moment and (OFFTIME) allow users to track screen time and specific app use. While it may seem counterintuitive to use your phone to limit your phone, these apps force us to face facts and provide self-imposed power-down times. Seven-day digital detox programs are becoming as popular as seven-day liquid fasts. Steps include turning off notifications, removing social media apps and eventually leaving the house without your phone. In our homes, screens should be secondary to human interaction and background elements in our decor. Tracy Davis, principal designer and owner of Urban Dwellings in Portland, says she has seen a trend in furniture design toward building USB ports right into pieces like end tables. 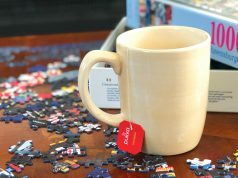 Some of these decluttering solutions, specifically the out-of-sight-out-of-mind ones, may actually help you reduce screen time, too. Attractive countertop charging stations can be purchased, but they can also be made. A simple DIY utilizes one of those decorative boxes, usually sold for storing photos. Find them at most stores that carry craft supplies. Cut a hole in the side for the power strip and holes in the front for the individual device cords. (Fancy tip: Use grommets to give the holes a finished look.) Plug all your chargers into the power strip, close the box, and decorate around it. If you want all electronics to disappear, load everything into the box and turn it so the holes don’t show. For storing those easily tangled cords, the key is to wrap, clip and stash. You might have some of the tools to do so right around your home. Keep thinner cords (earbuds, phone chargers) in check with those little plastic squares that keep bread bags closed. Wind up the cords and use the tag to pinch the middle. Clothespins work too, especially when doubled up with a some hot glue. For larger cords (computer charger, extension cords) hefty binder clips can work. 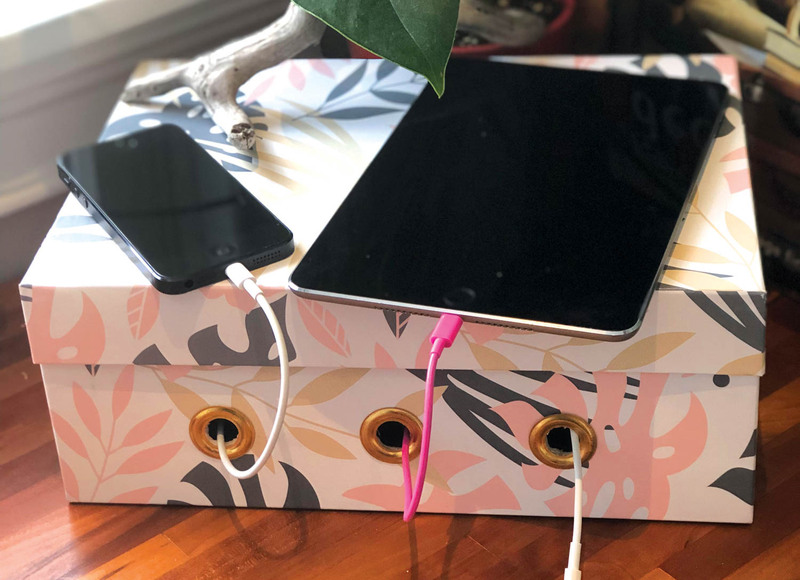 Jazz up your cord keeper with decorative washi tape or ribbon, label as needed and designate a drawer or box to keep everything electronics-related in one place. Hart believes family phone charging stations, where everyone’s devices are in a central location (say, the kitchen or front hall) are the best option. She says it is important to model healthy phone practices, especially for kids and teens. “Schedule phone-free times when the family puts phones away.” She suggests you ask nicely, like this: “‘I love our time together, would you mind putting your phone away so I can have your undivided attention please?’” Ideally, your phone stays at the family charging station overnight. This will help your sleep patterns. So will reading a book before bed instead of a screen. Turn on your Do Not Disturb function and put your phone out of reach in the bedroom, so you have to get out of bed to look at it. Phone is your wake up call? Alarm clocks are inexpensive. The beauty of these changes is that they can be incremental. We all know we shouldn’t text while we’re out at dinner with friends. But what if we didn’t immediately reach for our phones every time we have a spare (or bored) moment at home? If it wasn’t right at hand, we’d have more of an opportunity to make a choice, says Hart. That “takes us off autopilot and encourages us to take an active role in the outcomes and experiences of our lives.” Forgo that 15 minutes of browsing Facebook and use it for half a workout, folding laundry or taking a moment to write in a journal or fix a healthy snack. Plus side, if you need the phone, you know where to find it. It’s stashed in the cute station you created.